Now we can look at some results of the study. Be advised that some of these percentages may look small, but there are thousands of charts being examined. The methodology was to strive for a higher percentage difference when the raw numbers were small. Also, the numbers should prove to be cumulative – that is, the more factors that show up in a specific chart, the higher the chances of a fatal incident. The Experimental Group are 3,831 charts for the departure times for flights involved in fatal incidents (all originated in the United States because that’s the data that was available. The Control Group is 38,310 charts based on the data of the 3,831 Experimental Group, with year, month, place and time data shuffled randomly to replicate the demographics. There may be some non-astrological explanations for some of these factors – for example Sun and Mercury conjunct the Ascendant and Sun in the 12th House because of all the flights that depart early in the morning – but they hold up against a Control Group modeled on the demographics of the Experimental Group. In Part III, we’ll look at some examples and try to figure out what this all means. 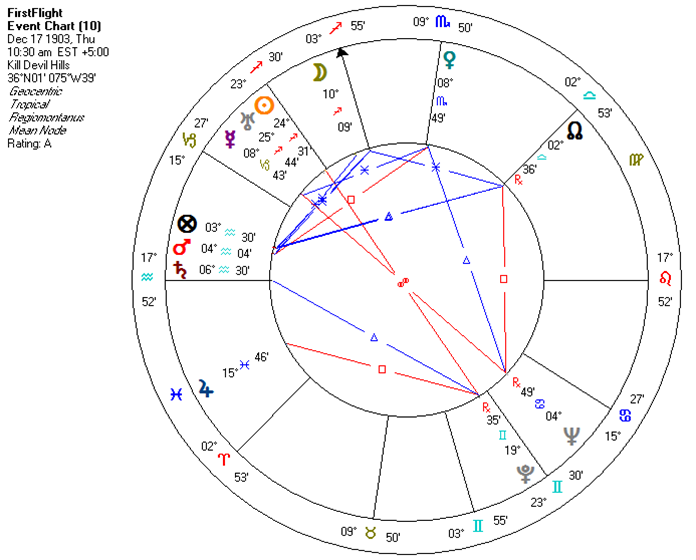 The only significant information the automated report (I tried to keep myself out of the process as much as possible to avoid bias) showed for Uranus was the South Node parallel. Unfortunately, since the AstroDatabank program is now unsupported and I’m unable to install it on any of my new computers to check out other factors, I’m unable to check for more factors at this point. Of course, I do disagree about Uranus ruling aviation. I choose to assign that to Mercury. Thanks Frank for posting this interesting piece of research work. I wonder if you made any notice on Mercury retrograde on the angles, or void Moon perhaps? And I must add that it is really unfortunate that AstroDatabank is not available for researh any more! If my meory serves me right, the present owner of the program received some kind of award recently but as far as I’m concerned he should receive such an award only after he’d give us the program back in the form which would enable statistical astro research. What do you think, Frank, and Jamie?